Four shark-nosed P40 Tomahawks of the 2nd Pursuit Squadron, AVG, took off from Rangoon’s Mingaladon Aerodrome in the crisp pre-dawn of 3 January, 1942. One turned back for engine trouble, leaving three to continue to their target, Raheng Aerodrome, a Japanese-held airfield outside of Tak, in northwestern Thailand. 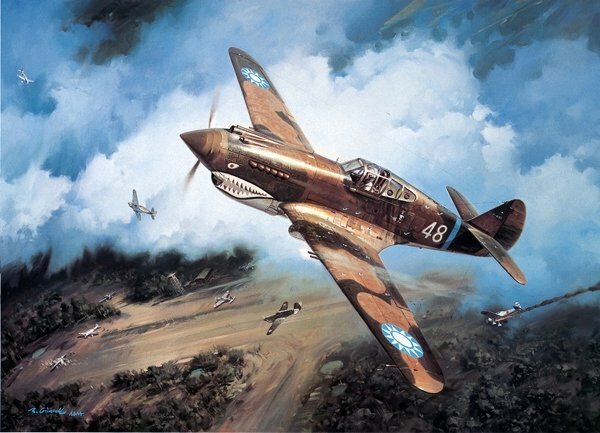 The victories were Hill’s first two of a string of 12 ¼ with the AVG, making him the second-highest scoring ace in the Flying Tigers. Hand signed by the Ace DAVID 'TEX' HILL and artist ROY GRINNELL.